When all the details fit in perfectly, something is probably wrong with the story. This is so like me. Never ask me to pet-sit for you. Or, even worse, baby-sit. And now to distract you from my stupidity: my favorite picture of me and my mom. You can say it–I was adorable. Me and my Child of the Sun-ness. Never Ask Teri to pet-sit. I just got it! Commen-teri…your NAME is Teri! AND COMMENTARY IS A WORD THAT SOUNDS THE SAME AND COMMENTERI! AND COMMENTARY (THE REAL WORD, NOT THE MADE UP) IMPLIES GIVING YOUR OPINION ON SOMETHING! AND THAT'S WHAT YOU'RE DOING ON THIS SITE! AND YOUR NAME IS TERI! 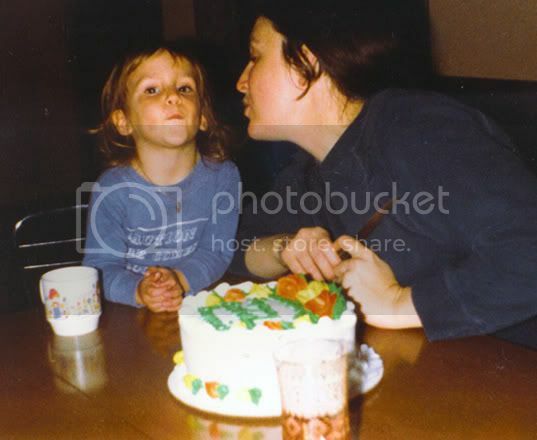 In reference to the above picture, why is your mom trying to eat you when there is a perfectly good cake right in front of her? Were you raised in a family cannibals? And if so, is there some cannibal code of conduct where you agree not to eat each other? And yes, I would assume most, if not all, cannibals would have to have some sort of code of conduct. Otherwise entire cannibilistic villages would be up for grabs and wouldn't survive long. And they'd have to have laws against eating your wife if she made you angry. That's just unfair. But no, my mom isn't trying to eat me. She leaning over to give me a kiss. I am about to kiss her back, but apparently I've always been a little slow and sucked my lips in to kiss someone. I do not do this now. I just felt as though I should make that clear. your nose used to be so cute and small.